A.P. Honda is generally known as Honda Motorcycle Thailand. Its headquarters are in Samut Prakan, Thailand. A.P. Honda plays a significant role as a center in distributing Honda motorcycles to Asian and European markets. A.P. Honda sponsors Thai riders to compete in Grand Prix motorcycle racing (WorldGP), particularly Moto2 class such as Ratthapark Wilairot, Thitipong Warokorn. Thailand motorcycle sales surpassed two million bikes for the first time in 2011, hitting 2.01 million. Sales rose to 2.13 million units in 2012, the highest level ever, before dropping to two million in 2013. In 2014, the market fell by 15 percent to 1.7 million due to political turmoil and delayed payments for farmers under the rice-pledging scheme. Thailand's motorcycle sales in 2015 totalled 1.68 million bikes, down one percent from 2014. In the first four months of 2016, 559,915 motorcycles were sold, down 3.8 percent on the same period in 2015. 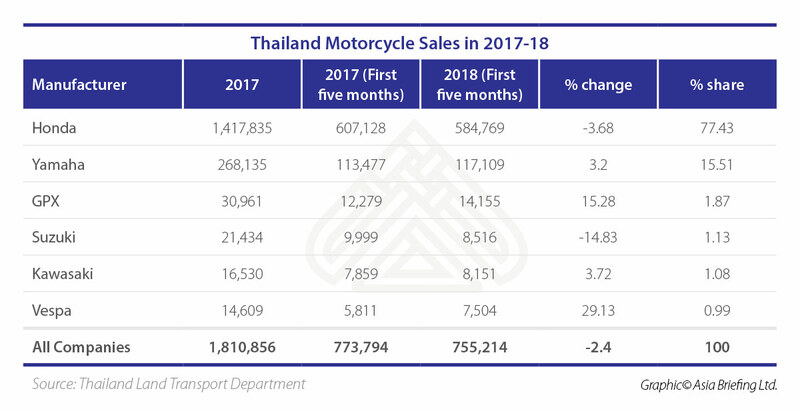 In 2018, overall motorcycle and motorbike sales in Thailand totaled 1,789,000 units, down 1.2 percent from 2017. The market is expected to decline further in 2019, to 1.76 million units. Honda is the motorcycle market leader in Thailand, with a 77 percent market share. Yamaha is second, with 15 percent in 2018, a figure projected to rise to 16 percent in 2019. ^ "AP Honda shoots for 1.4m sales this year". The Nation. 2014-01-17. Retrieved 28 May 2016. ^ Maikaew, Piyachart (2016-05-28). "Suzuki fears bumpy road for motorbikes". Bangkok Post. Retrieved 28 May 2016. ^ a b Maikaew, Piyachart (2019-02-09). "Yamaha to boost sales despite murky view". Bangkok Post. Retrieved 2019-02-09. ^ Dezan Shira & Associates (2018-07-12). "Thailand Motorcycle Sales in 2017/18". ASEAN Briefing. Retrieved 2019-02-09.